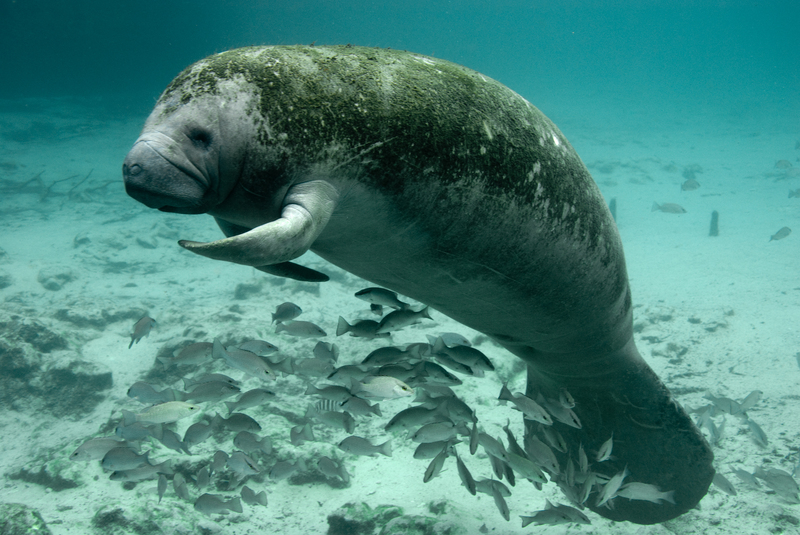 West Indian Manatee ; Most manatees spend half their day sleeping in the water and the other half grazing on underwater plants. They are generally solitary creatures, unless mating, caring for their young, or sheltering in warm springs. A female will give birth about once every three years to a single calf, which will stay with her for twelve to eighteen months. Manatees can grow up to thirteen feet (4 m) long, weigh fifteen hundred to eighteen hundred pounds (680 to 816 kg) and live up to sixty years. They have grayish-brown thick wrinkled skin and propel themselves along with flippers and a large, flat tail. They evolved over millions of years from land mammals, and their closest living relatives are the elephant and the hyrax.